The Teleporter with Rotation Home Version is a FAST, simple teleporter, perfect for a SL home, such as a Linden Home. This teleporter is a minimized version of my Teleporter with Rotation Full Version. Minimizing the code in the Home Version allows the MAXIMUM SPEED possible for short hops, like upstairs, between rooms, etc. If you only need to teleport a short distance, this is the fastest teleporter for the job. While this teleporter has a full region range and can reach a skybox, it is best for short distances under 30 meters. The Teleporter with Rotation Home Versionis easy to add to your home and set-up. Use it to quickly teleport up and down stairs (3-4 floors) or from room to room. No menus, just one click to teleport! Just like it’s more expensive big brother, the Teleporter with Rotation Home Version leaves your avatar facing the direction you want, a feature usually only found on expensive models. No more teleports that leave you facing a wall! Have fun using teleporters in your SL home! Teleporting is much faster than trying to navigate your avatar on narrow stairs or through narrow doorways. Create door-less hidden rooms using teleporters to enter through the solid walls! Put them in a chair to surprise someone when they sit down. Voom, and they’re 40m away in an unexpected place! Pop them up to the roof! (Just make sure they have a good sense of humor!) This teleporter is low cost and it has copy permission, so buy just one and make multiple copies for use throughout your house or property. This Teleporter uses the latest Second Life Teleporter Technology. The Leaf Illusion Teleporter with Rotation Home Model uses the new LSL Teleport function “llSetRegionPos” created for teleporting by Linden Lab and released in late January 2012. This isn’t an old, outdated, freebie teleporter script downloaded from the web and repackaged for sale! The teleport scripts in the Teleporter with Rotation series are unique, and were written specifically for these teleporters by Leaf Illusion. The Teleporter with Rotation Home Version is fast and fully configurable. For longer teleports, such as to skyboxes, I recommend using the Teleporter with Rotation Full Version. It uses a notecard for user settings, making updates easy and fast. Just swap out the script and it’s updated in a few seconds. No need to reconfigure or position a new replacement teleporter. Guaranteed: If you buy it and decide you don’t like it, IM LeafIllusion and ask for a full refund. Sound good? Purchase the Teleporter with Rotation Home Version at the Second Life Marketplace. Rez the Teleporter with Rotation button from your inventory. Move your avatar to the desired landing destination(s) and write down the location coordinates shown in the current location/navigation bar. Rez the Global Rotation Compass at your landing destination to find the degree rotation you desire. 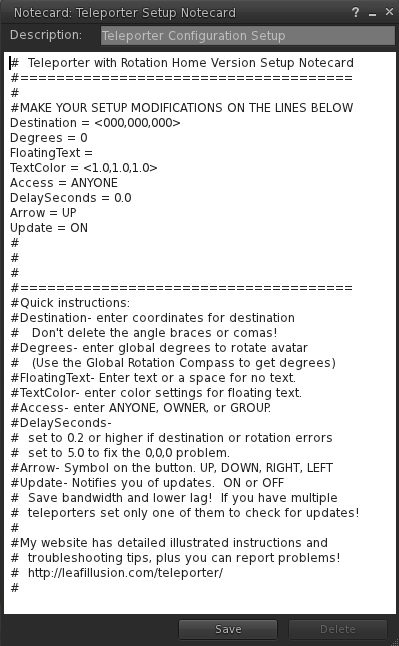 Edit the Teleporter Setup Notecard to add your configuration as follows. Destination: Replace 000,000,00 with the destination coordinates you wrote down above. Degrees: Replace 0 with the rotation degrees from your compass. Rotation direction is to the right from global 0 (north), or clockwise when looking down. FloatingText: If you want text to float above the teleporter button add it here. TextColor: You can change the text color. See detailed directions below for suggestions. Access: Who may use your teleporter? Enter ANYONE, OWNER, or GROUP. DelaySeconds: Leave set to 0 for now. If testing reveals lag problems add a delay value here. Arrow: Which way the graphic symbol points. UP, DOWN, RIGHT, LEFT. Update: Not used in the Home version. Save the notecard. The teleporter will chat back the settings to you and notify you of any major errors. Test the teleporter. Don’t forget to hit “Esc” a couple of times before you teleport to reset your viewer camera. The first teleport will probably be slower than normal as the teleporter needs to set up some values the first time. That’s it! There is a Troubleshooting Sectionat the bottom of this page if you have issues. Teleporter with Rotation Home Version 2 and higher. TIP: Most people can easily set up the Teleporter with Rotation by just looking at the pictures below and reading the captions. Stand your avatar at the destination you want to teleport to. 1. Drag the Global Rotation Compass from your inventory to floor. 2. Write down the destination coordinate numbers. 3. Write down the degrees rotation you want the avatar to face. Use the arrows to drag the button to the desired location. On the line labeled “Destination” replace 000,000,000 with the 3 destination coordinates you wrote down earlier. Do not delete the angle brackets < > ! Find the section of the notecard where the setup settings are. The settings are on the lines that do not start with the pound sign #. You must replace 000,000,00 with your desired destination coordinates. If you leave the destination set to 0,0,0 you will get an error message. This is to prevent you from accidentally teleporting yourself to 0,0,0 which is not a fun experience. On the line labeled “Degrees” replace 0 with the rotation degrees you wrote down earlier from the compass. 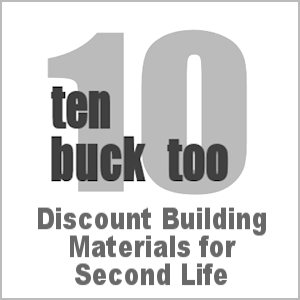 You can leave it set to 0 if desired. That’s all the settings that need to be addressed now. The remaining settings are optional. When you are done editing the settings click on “Save” to save them. The teleporter will read the new settings as soon as you save them and will repeat them back to you in the chat dialog so you can confirm them. The teleporter has an extensive error checking routine that will look for any errors in your notecard settings after you save them. If an error is detected it will chat an error message to you. If upon testing the teleporter does not place your avatar at the correct location or rotation, see the description below of the optional “DelaySeconds” setting. See below for descriptions of the other settings. FloatingText. The default setting is a blank space which means no text will float above the teleporter button. You can insert any message you desire . So you could write “Teleport Upstairs”. A warning: the floating text can be seen through walls! So if you mount the teleporter button on a wall, the text will be visible from the other side of the wall. Understanding Groups: Groups are tricky, both the teleporter and the avatar must have the same group activated. If you want to use the GROUP setting be sure to set the proper group for the teleporter button. In the default viewer, Right click on the teleporter button, select “Edit” to open the editor window, select the “General” tab and make sure the proper group name shows on the line labeled “Group:”. Click on the wrench icon to select the group. Next the avatar must have the group activated, not just belong to it. So the avatar must click on the “People” then “My Groups” and finally must right click on the group that the teleporter belongs to and select “Activate”. If you’re thinking using groups is a pain, your right. But that is how Second Life has it set up, so I can’t change it! DelaySeconds. This is used to slow down the teleporter. 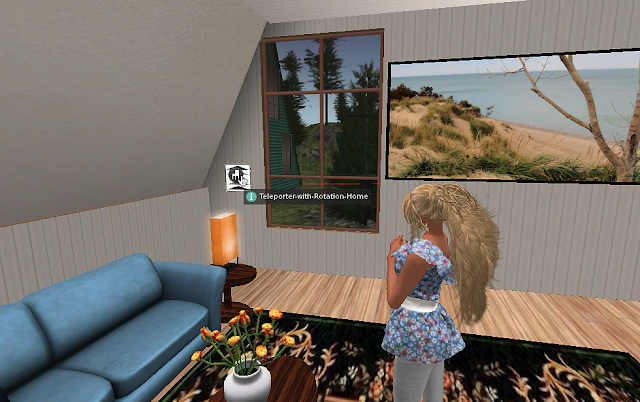 The graphic display that a user sees on their screen when teleporting varies depending on a lot of factors, such as the user’s computer speed, Internet connection speed, and Second Life Viewer settings. The actual script that operates the teleporter operates on the Second Life server and runs extremely fast in most situations. So it can easily “outrun” these other factors and this can cause visual errors. There are 3 common visual errors that the user sees on their screen when this happens. Destination or Rotation is wrong. In this situation the avatar lands at the wrong destination or doesn’t rotate to face the direction you set. This is a classic case of the server script and user’s computer running at very different speeds. It’s similar to the problem you sometimes see where your avatar keeps walking when it should stop. The cure is to set the DelaySeconds to “0.2”. If that dos not correct the problem increase the value to “0.4”. Keep increasing the DelaySeconds value until the problem is corrected. To understand what is happening here you need to understand how the teleporter works. When the avatar is teleported the avatar actually attaches itself to the teleporter button. The button then is moved to the destination, where it rotates and drops off the avatar. Then the teleporter button returns to the original location to await the next use. If the region’s server is overloaded the avatar may be dropped by the teleporter before the avatar reaches the destination or proper rotation. The opposite is more common, the server runs so much faster than the user’s computer that after the avatar is dropped off it gets “dragged” back toward the original location by the teleporter. The 0,0,0 problem. This one is actually caused by a Second Life bug in the function that is used to teleport avatars. It occurs primarily when teleporting distances over 50m, although it can show up in some sims for shorter distances. When this problem happens the avatar appears to jump to the coordinates 0,0,0 for a few seconds before eventually arriving at the destination. You can fix this by setting the DelaySeconds value to 5.0. Update. Not used in the latest Home version. If your notecard has this line on it just ignore it. It can be set to either ON or OFF, neither does anything. Press the Esc button twice to reset your camera angle. Left click on the Teleporter with Rotation button. You can edit the Teleporter button to change it’s shape, size and appearance. The button is just a normal prim, you can make many other modifications to it using the edit menu. You can change the size and shape of the teleporter button. Click on the “Stretch” button, then the “Objects”tab, then adjust the values listed under the “Size (Meters)” heading. If you want the button to be less bright, click on the “Texture” tab, then uncheck the box labeled “Full Bright”. You can replace the image on the teleporter with any other texture or image. For example, you can replace it with a picture so that the teleporter button looks like a picture hanging on your wall. F. Preventing Vanishing of the Teleport Button when in use: Most people won’t have an issue with this in home use. When the teleporter is in use the button vanishes while the avatar is being teleported. This is because the avatar is actually attached to the teleport button and the button “carries” the avatar to the destination. Then after dropping off the avatar, the button returns to its original location. Depending on the amount of lag, this may take several seconds to happen. During that time the teleport button is gone from its original location. The solution is rather inelegant, but works. Simply use two teleporters, one right in front of the other. When the first one is in use and gone, the second teleporter’s button behind it will now be visible. After the teleporter is fully set up, create a duplicate copy of it using the copy-move editing feature. This is easier to do if you move so that you are looking at the teleporter button from the side. Right click on the Teleporter and select “Edit”. Select the button labeled “Move”. Hold down the shift key and use the move arrow and drag a copy of the teleporter button out a short distance. If you are using floating text, edit the notecard in the front copy to remove the floating text from it (so you don’t get a double text effect.) Move the copy back, so that it is right in front of the original and they appear to be a single button. Now when someone uses the teleporter they will be clicking on the front button. It will carry them away, leaving the second copy behind it visible and available for others to use. If your avatar actually sits on top of the teleporter, something is wrong. The most common cause is that somehow the script has been deleted. Edit the teleporter and select the Content tab. There should be a notecard and a script in the contents. If not, take another copy of the teleporter from your inventory. Then copy the script from the 2nd teleporter to your inventory, then move it into the contents of your original teleporter. If all else fails, delete the teleporter and rez a new one and try setting it up again. After saving the notecard it goes blank. All the settings are gone! Don’t panic and don’t click on save again. This is a known Second Life bug, unfortunately there is nothing I can do about it. But there are a couple of work-arounds. The information is still there, you just can’t see it. First try closing the notecard by clicking the X in the top right corner of the edit window. Now reopen it. Sometimes that works. If that doesn’t work you can use the shift-copy trick. Open the teleporter prim for editing, just like you would if you wanted to move or reposition it. Hold down the shift key and use the arrows next to the teleporter button to drag a copy of it to one side. Now delete the button you dragged. The button that remains in the original position will now be editable again. You can also fix the problem by simply logging out of SL and then logging back in. Which makes it appear the bug is in the viewer. Of course that is a time-consuming pain in the rear! After teleporting the teleporter button does not return to it’s original location. If you relocate or resize the teleporter button you also need to resave the teleporter script settings when you are done. The script stores the teleporter button’s location in memory, which allows for faster teleports. But it also means you need to update the location in the memory if you move the teleporter button! To do this right click on the teleporter button and select edit. Click on the “Contents” tab then double click on the notecard. (Just like when you originally set up the teleporter.) Make a minor change, then undo it, this will activate the save button. Now click save. The teleporter will reread the notecard and then it will update the teleporter settings, including the location. Avatar dances or hops around when trying to use the teleporter. This probably means the teleport didn’t occur. There could be a number of reasons. The notecard may not be properly setup, or the avatar may not have permission to use the teleporter. Look for an error message in your chat or IM. The dancing and hoping is likely the result of the avatar’s AO (animation override) or some other animation device or attachment on the avatar. When the avatar tries to use the teleporter the avatar sits on it, like it would on a chair, or couch, bed, etc. Since the teleport doesn’t happen, the teleporter immediately unsits the avatar so it stands back up. Something about how quick this happens seems to mess up some avatar’s AOs. Update: I’ve added a short delay which seems to help reduce the problem, so hopefully it will now be a very rare problem. If clicking on the teleporter does not do anything check the “Click to” setting. Right click on the Teleporter and select “Edit”. Select the “General” tab. Look for the line “Click to:” and make sure it is set to “Sit on object”. Slow Teleports over 30m. This is normal for this teleporter. Sometimes increasing the draw distance in your viewer will help (look in preferences/ graphics settings/ advanced settings of the viewer.) If the destination is beyond the draw range set in the viewer, the viewer seems to get lost and has trouble finding the destination for the camera. Sometimes the screen also shows the location 0,0,0 and your avatar may be grossly contorted for a few seconds (see the installation instructions above for setting the DelaySeconds value.) This is normal behavior for Teleporter with Rotation Home Version when teleporting over 30m distance and why it is recommended only for short teleport distances. The Teleporter with Rotation Full Version has features that try to avoid this problem and is suggested if you need to teleport distances over 30m. Sometimes you will get an incorrect landing rotation or even a slightly off landing location. Sometimes nothing happens at all. First, it is normal to be off the target by 1 meter. This is just the normal level of accuracy of the SL scripting language’s teleporter functions. There are also two more possible causes of this. 1.) The first is processing speed issues between the SL server and your computer. See the detailed installation instructions above for how to use the DelaySeconds setting to correct this. Setting a short delay to slow down the script will correct the problem in most cases. 2.) The other cause is very simple, it is caused when your avatar lands and then takes a step as it is dropped off the teleporter. It is actually occurring after the teleport is completed, so the teleporter can’t stop it from happening. Often this is the result of an AO (Animation Overrider) that adds movement to your avatar when it is in the standing position. Try turning off your AO and if the problem goes away, it is the cause. The teleporter button vanishes after use. 99% of the time it still is there, you just can’t see it. Try right clicking on the location where it should be, this will sometimes make it reappear. Sometimes if you walk or teleport to a distant location then return it will force a redraw and reappear. Otherwise you may need to log off and back on in order to see it again. This often occurs when testing the teleporter, because you are using it rapidly and it doesn’t have time to “recover” before you use it again. (After a avatar is teleported the teleporter needs several seconds to do some clean-up operations before it is ready again. Unfortunately it will not wait for these to be completed before allowing the next use. This is an issue with the script execution speed going much faster than the viewer can process the graphics that get displayed.) During teleport the teleporter “goes alpha” and turns transparent. This is so you don’t see it flying around. But sometimes there is a hickup and the command to turn visible again doesn’t get processed. the teleporter is probably still there, you just can’t see it. The script takes a couple of actions to try to prevent this, but nothing seems to make it 100% reliable, short of forcing the script to slow down to a unreasonable level. It’s one of those impossible problems, the purpose of this script is fast teleports, so I chose to go with a small failure level rather than slowing everything down 100% of the time. If you rapidly teleport several times in a row the landing location and rotation will change. This is because the new teleport operation is initiating before the older one has completed, causing them to interfere with each other. Wait a couple of seconds after your avatar stops moving before you teleport again. If you can’t change the settings, the teleporter may be locked. This is only an issue on the older models prior to version 2.4. Right click on the Teleporter and select “Edit”. Select the “object” tab, then uncheck the box labeled “Locked”. 1. If you relocate or resize the teleporter button you also need to resave the teleporter script settings when you are done. The script stores the teleporter button’s location in memory, which allows for faster teleports. But it also means you need to update the location in the memory if you move the teleporter button! To do this right click on the teleporter button and select edit. Click on the “Contents” tab then double click on the notecard. (Just like when you originally set up the teleporter.) Make a minor change, then undo it, this will activate the save button. Now click save. The teleporter will reread the notecard and then it will update the teleporter settings, including the location. 2. The teleporter does not have permission to enter the destination property. If this happens the teleporter button may be gone forever, never to be seen again. When you teleport your avatar, your avatar actually attaches to the teleporter button and the button moves to the new location. Because the teleporter button is a prim, if you are not allowed to place a prim on the property at the new location, the prim will be rejected.The teleporter itself will either be returned to you as lost and found, or you will possibly find it stuck at the border of the property you tried to teleport into. The fix is to make sure the teleporter owner has permission to build on the destination property. The teleporter can not teleport an avatar onto property without building rights. If you relocate the teleporter button, you may need to readjust the rotation. If you have a version 2.0 or older teleporter you may need to reset the landing rotation in the script if you change the rotation of the teleporter button. The teleporter button vanishes for a second or two after being clicked on. This is normal. When the teleporter is in use the button vanishes while the avatar is being teleported. This is because the avatar is actually attached to the teleport button and the button “carries” the avatar to the destination. Then after dropping off the avatar, the button returns to its original location. Depending on the amount of lag, this may take several seconds to happen. During that time the teleport button is gone from its original location, which could be an issue in a busy store where other customers might want to use it. The solution is rather inelegant, but works. Simply use two buttons, one right in front of the other. When the first button is in use and gone, the second button behind it will now be visible. After the teleporter is fully set up, create a duplicate copy of it using the copy-move editing feature. This is easier to do if you move so that you are looking at the teleporter button from the side. Right click on the Teleporter and select “Edit”. Select the button labeled “Move”. Hold down the shift key and use the move arrow and drag a copy of the teleporter button out a short distance. If you have placed the optional floating text over the teleporter, edit the script in the front copy to remove the floating text from it (so you don’t get a double text effect.) Move the copy back, so that it is right in front of the original and they appear to be a single button. Now when someone uses the teleporter they will be clicking on the front teleporter button. It will carry them away, leaving the second copy behind it visible and available for others to use. Other avatars see the teleporting avatar stand, sit, or walk around the teleporter. If avatar#2 is watching avatar#1 use the teleporter, then avatar#2 may see avatar#1 either sitting on the teleporter or standing around it for a second or two after the teleport happens (avatars with AO’s tend to wander around, those without tend to sit or stand.) This is normal, because the viewer doesn’t know what happened to avatar#1. Try this test: Position avatar#2 someplace where they can see both the teleporter and the destination. Now have avatar#1 teleport. This time they will see avatar#1 quickly jump to the teleporter and then within a second, avatar#1 will disappear and reappear at the destination. This time the viewer could see avatar#1 reappear at the destination, so it quickly shows that. Before the viewer didn’t know where the avatar#1 went to. So the viewer continues to show avatar#1 at the teleporter for a few seconds in case it is a communication glitch. After a few seconds it assumes that avatar#1 is actually gone and deletes it. 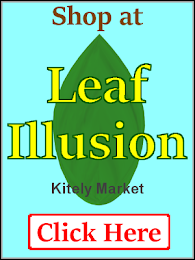 If you have a problem with the teleporter with Rotation that you can’t solve please email the Leaf Illusion Store or send an IM in-world to Leaf Illusion. A contact link is at the bottom of the page. I may not be able to help you but I’ll try. I also want to know of problems and suggestions regarding the Teleporter. July 2014. Removed the Update Checker as it is no longer supported by the 3rd party company that provided the service. It used the Internet to check for updates and the website it used has disappeared along with the guy who sold it to me. From this point on you will need to contact me for an upgrade. Version 2.7 simply removes the updater and does not provide any noticeable benefits, so probably not worth the effort of upgrading. However if you still would like an upgrade to 2.7 send an IM to Leaf Illusion in world or email me using the contact email on this website. I need the avatar username you bought the teleporter with so I can confirm your purchase. NOTE: The upgrade script only works in teleporters purchased from Leaf Illusion. Added a notecard for settings. Version 2.4 will use a notecard for the user configurations. No more script editing! OK, editing a notecard is no easier or harder than editing a script. The big advantage is that this should make upgrades much easier. Free updates. From now on updates are free for those who purchased the teleporter from the Leaf Illusion Store or an authorized reseller. Update Checker. There is now a built-in update checker that checks for updates. if an update is available it sends the owner an instant message along with a free copy of the updated version. Because frequent checks could cause region lag, the update checks are performed no more frequently than every 3 days. Update checks are triggered by a change in the teleporter notecard settings, and also by region restarts. Added a user-configurable delay. After a lot of testing it was apparent that a “one size fits all” approach just is not very optimal. 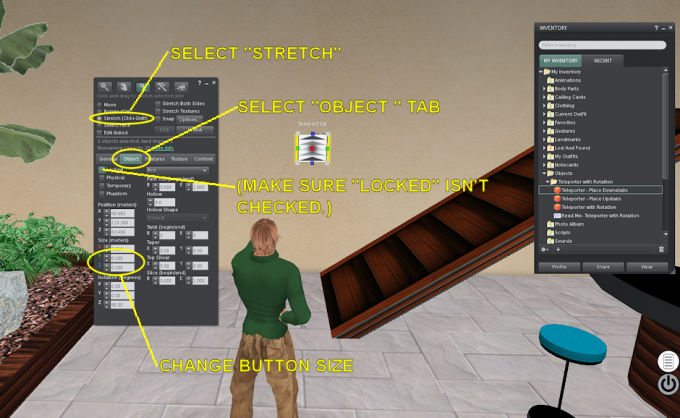 The problem is that some sims need a delay built into the script because the script (which runs on the Linden Lab servers) actually runs so much faster than the user’s computer can render the graphics that it screws up the teleport. But the delay for each sim is different, and even different teleporter locations & distances in the same sim can benefit from different delays. Most teleporter makers cover this by just throwing in a 5 second delay for everyone. However, most users probably will not need a delay at all, so I hated the idea that 80% of the users would be slowed down just because the other 20% will have lots of errors without a delay. This user configurable delay allows everyone to get the highest speed possible. A lot of code optimization, changing the order in which things happen, trying to figure out where things need to be slowed down and where they can be sped up. The primary section of code that causes the teleport has been rewritten once again. Tried a lot of different approaches and did hundreds of tests in various sims with various lag levels. Arrow Direction. You can now set which direction the arrows on the button point. So no need for separate up and down buttons. The teleporter button can be set to point up, down, left, or right. Error Checking. The version 2.4 and higher has a number of error checking routines designed to inform the owner of problems before they cause disruptions. While trying to keep the Home Version as lean and fast as possible there are a few changes and new features to help it perform better. New Script. The script is completely rewritten and is now exclusive to this teleporter. The original script in versions 1.0 and 2.0 were basically standard teleporter scripts that had been hacked to add the rotation and new teleporter functions introduced by Second Life in early 2012. Almost all of that original “open-source” script has been eliminated. The rotation is Global (World). So no matter how you rotate the teleporter button, or which way the avatar is facing when they teleport, the direction the avatar will land is in relation to the SL “world” rather than any objects. In versions prior to 2.2 the rotation was based on the teleporter button’s rotation. Rotation is now confirmed. The teleporter script now checks to see that the avatar has been rotated before it releases the avatar at the destination. This gets rid of the problem with avatars not rotating properly in high lag sims. There is still a time-out limit placed on the rotation process so that if something goes terribly wrong the avatar won’t be left stranded on the teleporter. Time Out and graceful recovery. A timer starts at the beginning of the teleport and if the teleport has not completed within 10 seconds it trips a recovery sequence. This sequence will attempt to drop off the avatar and return the teleporter to it’s home position. An error message will be whispered to the user, warning that the teleport failed. Version 1.2 added customized text to the right click contextual menu that comes up if you right click the teleporter button. Also changes to the packaging and permissions to add consistency and clarify. Version 1.1 includes a new transparency feature that hides the teleporter button during teleport. Version 1.1 also incorporates a fix that significantly reduces the incidence of incorrect avatar rotation during times of moderately high lag.